Japan was visited by typhoon Jebi today at its west coast. 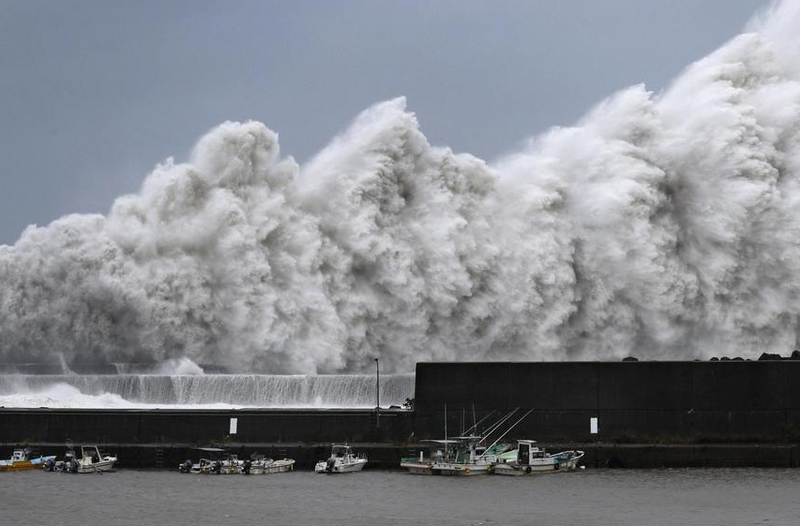 The storm landed around noon local time on the island of Shikoku and completely stopped public life on a major part of the island. In Osaka Bay it was able to sweep a tanker into a bridge and in Kyoto parts of a railway station roof came down. According to Kyodo news so far at least two people have been killed by the storm, which is expected to weaken as it moves north. The strength of the typhoon was so great that it smashed a huge tanker ship into a bridge. The 292-foot-long Houunmaru ship was taken from its anchored position at sea and smashed it into a bridge near Osaka. Jebi is one of the heaviest storms of the season and raged this morning over the metropolis of Kobe. The typhoon is expected to continue towards the densely populated regions of Nara and Osaka (the second biggest city in Japan). More than a million people have been called to leave their homes, more than 177,000 families are without electricity. Public life has virtually ceased in the affected regions. Prime Minister Shinzo Abe has called for an emergency crisis meeting to oversee the rescue effort.